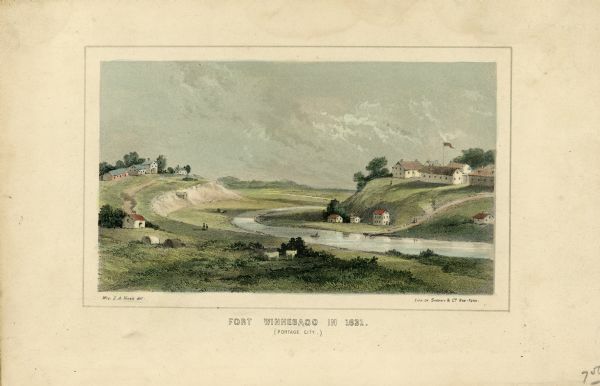 Drawing of Fort Winnebago (near present-day Portage) that illustrated "Wau-Bun," Juliette Kinzie's memoir of her experiences on the early Wisconsin frontier. Mrs. Kinzie arrived at Fort Winnebago in 1830 with her husband, Indian agent John Kinzie, and they lived there until 1833 when he resigned. Her drawing is meant to represent the fort after the construction of the Indian Agency House on the hill to the left of the Fox River. The house was planned in 1831 and completed in 1832. In the 1930's the house was restored. The project was begun by the Wisconsin Federation of Women's Clubs and after a year the project was taken over by the Colonial Dames of America Society of Wisconsin. "Wau-bun," published in 1857, is still regarded as a classic account of Wisconsin history.